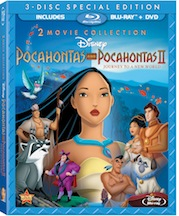 This special edition includes both Pocahontas films and bonus features. This action-packed animated musical adventures Pocahontas and Pocahontas II: Journey To A New World are timeless stories of hope, courage and friendship that the whole family can enjoy. 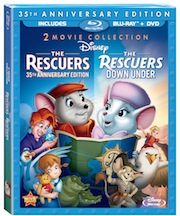 It is the 35th anniversary of the original classic, The Rescuers and The Rescuers Down Under. Join two of the world’s bravest mice, Bernard and Bianca as they set out on two thrilling rescue missions full of comic adventure. These tiny heroes with big hearts outrun and outwit their rivals to save the day. 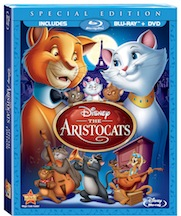 The Aristocats is a fun, comedy and adventure that is fun to watch. The exciting tale takes place in Paris where a kind and eccentric millionairess, wills her entire estate to ‘Duchess,’ a high society cat, and her three kittens. When the bumbling butler Edgar tries to pull off the ultimate catnap caper in order to secure the fortune for himself, it’s up to alley cat Thomas O’Malley and his band of swingin’ jazz cats to save the day.